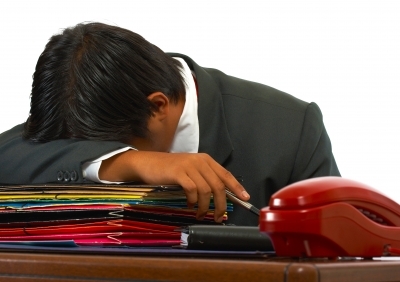 Make sure your contract allows you to terminate if your agent is caught napping! If you are thinking of appointing a Sales Agent, either in your own country or overseas, you should be sure to to have the terms agreed in writing. A good contract will protect your interests and help you avoid disputes or lose sales. This article explains some of the key issues to cover. They apply at home as well as abroad, but because selling into another country is more complex, a written agreement in that case is essential. Why Appoint a Sales Agent? One way of increasing your sales is to appoint an agent who finds customers for you and receives commission on the sales that you make to those customers. And this applies whether you are selling goods or services, and whether you want to find customers at home or abroad. It is one of the most cost effective ways of getting into a new territory for your products. Once you have decided on the territory where you want to market your goods or services, you will need a reliable agent – i.e. someone who has the right qualities and experience and, so far as you can tell, he is likely to deliver a reasonable return for you. But it is important that you have a written contract with the agent that sets out the key terms agreed between you and which allows for the arrangement to be brought to an end if it does not work out for you. Typically the key situation to avoid is that your agent doesn’t make sales for you, but you are locked into a contract and can’t terminate it for some time. This could be because the agent decided to focus on another client or simply isn’t great at getting you customers. So make sure you have sales targets and termination clauses that protect you. Your prospective agent may want as big a territory as possible and he might even want to cover neighbouring countries. Resist this – start with a limited area and see how it develops – it’s much easier to expand than contract the territory. Similar principles apply to the products he will sell: especially if you have a wide range. Start by appointing the agent to sell one line of your products and if that works out, you can expand the agreement. Is your agent appointed on an exclusive basis – i.e. is he the only agent for the territory or might you want to have more than one agent there? If it’s exclusive, make sure you can rely on your agent to sell well. What is the initial term or duration of the agreement? Make it long enough to give the agent time to get established and into the market with your products, but no longer. It can then be renewable yearly if things work out. Set out the commission payable – which may be on a sliding scale depending on sales volume, when it will be due – monthly, quarterly, etc., how payment will be remitted and allow for adjustment if there are refunds or customer default. This is one of the most important terms as it allows you to monitor the agent’s performance. So start by specifying some (preferably agreed) sales targets in the contract – e.g. £10,000 of sales in the first 6 months increasing to £7,500 a quarter after that. And include a clause that allows you to revise the targets each year. As well as monitoring performance, this can be useful to trigger termination if the agent underperforms as well as challenging any claim that he makes for compensation if you do bring the contract to an end. It is sensible to identify what marketing material and technical data you will provide and if training of the agent’s sales staff is needed. You may also want to have terms that require the agent to have a marketing budget, to report on sales prospects at regular intervals etc. Protect your copyright and trademarks and make it clear that the agent’s right to use your trademarks and trade name is strictly limited. It can also be useful to require him to notify you if he comes across any unauthorised use of your intellectual property rights in his territory. You need a clause that allows you to terminate if the agent commits a breach, fails to meet targets or becomes insolvent. And he will want the right to terminate for non-payment of commission. If the agent is a limited company you might also want the right to bring the agreement to an end if a key player in the company leaves the company. Also, with an overseas agent, be sure to check what the local law says about termination and what compensation might be claimed. Within the EU there are rules that allow an agent to claim compensation or an indemnity on termination. We have a free download on this: Z163 Commercial Agents in the EU – Legal Aspects. You may want a clause that prohibits the agent from representing any of your competitors during the agreement and for a limited time after it comes to an end. Also it is advisable to have a confidentiality clause so that information concerning your business is kept confidential. If you are UK based, you may think the contract should be governed by English law and disputes resolved in the English courts. But if the agent is based abroad, this may not be the best solution. If the agent has no assets in England, there may be little point in suing him there as you would have to get the judgement enforced in his own country – and that is likely to necessitate bringing the proceedings all over again. Arbitration is often a good solution. On this and the terms generally, it is essential to get legal advice in your agent’s country as well as your own before finalising the contract. This entry was posted in Business Contracts and tagged agency agreement, agent appointments, contract clauses. Bookmark the permalink. Previous Post: Beware the Small Print on Your Website! As profits grow incrementally, do losses accumulate excrementally?